Ask fellow campers about "South Marcum Campground" and nearby attractions. We were walk-ins, and they went above and beyond to get us in. We called ahead and she had two full hookup sites left - but then we were delayed because of a traffic accident. She was so nice about it and even left a map in her outside box so we could find our way to our site. We had a fabulous waterfront site from a last-minute cancellation. Only minor complaint is the traffic noise from I-57, which is quite noticeable at night. The circle on my picture shows where I-57 crosses Rend Lake, doesn't look close but it sounds close. 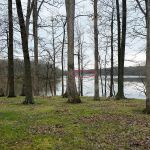 We camped at South Marcum Campground in a Travel Trailer. Our first site, #82, was extremely unlevel. Do not recommend this site except for the smallest trailer. We were moved to site #72 which was perfect. Beware of site #82. We camped at South Marcum Campground in a Fifth Wheel. Our 3d overnite stay in Owl's Roost section in 7 years. Well kept COE park with paved roads and sites. Extensive biking and hiking paths, lots of forest with deer, squirrels seen. Other sections have sites by the large lake. At Owl Roost electric only at 11 of 18 sites. a toilet/sink hut only with a water faucet close by in center of Owl Roost loop. Dump near entrance. My main complaint is almost all sites in the park are unlevel as seen from a biking around, many badly. Overall, the park is a great public resource. We camped at South Marcum Campground in a Motorhome. The person that checks you in was awesome. The campground litterally had 4 out of every 5 sites slanted. We had 4" under the back wheels and our trailer tongue was on the ground and we still were not level but it worked. We had, in our opinion one of the 2 best sites onto park. Excellent view, private but you could hear highway noise depending on the wind. Our site did need a better pick-up. We camped at South Marcum Campground in a Travel Trailer. This is a beautiful COE park. Restrooms and showers very clean and grounds well kept. We didn't have a lakefront site but it was a short walk to the lake. Would definitely stay here again if in the area. We camped at South Marcum Campground in a Travel Trailer. Well maintained and clean park. Very nice site - F/H, fairly level with ample space between sites. Shaded with parking pads. 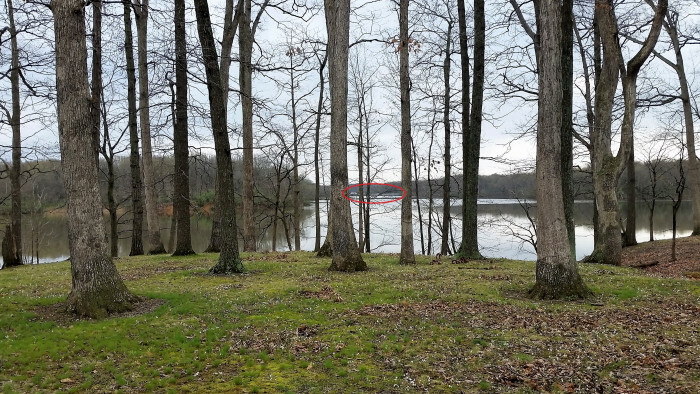 Located on a huge lake with nice walking paths. This is a fantastic COE park. Would definitely go back if in the area. We camped at South Marcum Campground in a Fifth Wheel. Park itself has hiking trails & biking paths. Large lake for boating, fishing & swimming. Beautiful grounds with large shelters for groups. Just went to a Pizza Hut & Walmart in town of Benton. Were not aware if there were any attractions in the area. We've stayed here three times and love the campground. Peaceful, beautiful, deer, raccoons, skunks, and lots of good walking areas. Sites are mostly shady, gravel and feature a picnic table. The campground is convenient to Interstate 57. We camped at South Marcum Campground in a Motorhome. The campground is pretty close to St. Louis. No different from many COE campgrounds - nice concrete pads that are reasonably level, decent roads, and trees that are trimmed back so that they don't scrape the coach sides when driving in. This was pretty heavily treed and the satelite did not work in our site, but we did have full hookups! And there is a great bike riding path - paved, well marked and it goes for 20 + miles. Overall, a very nice park to visit. We camped at South Marcum Campground in a Motorhome. Huge COE cg on Rend Lake with loads of trees with park like grass understory but some wooded areas. Multiple loops in the CG some with small toilet/sinks buildings, and the larger bathhouses in the larger loops have showers. Roads and sites paved but most of the sites were just paved to conform to the shape of the sloping terrain and are unlevel needing lots of leveling effort. Biking is great with the paved roads and concrete bike paths. It is a beautiful spacious park. We camped at South Marcum Campground in a Motorhome. This was our second stay at South Marcum Campground and both times were extremely pleased. We were in site 69, a full hook-up site. The area was clean and well cared for, abundent wildlife, good spacing between campsites and easy to travel roads. 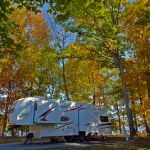 We camped in a 40 foot fifth wheel and found many sites that would have been long enough. The road to the park (Rend City Road) was fairly rough but short in distance. We camped at South Marcum Campground in a Fifth Wheel. As with most Army Corp campgrounds, this was a very nice campground. The sites are paved with most having a concrete pad adjacent to the blacktop drive. (Some of the concrete pads are in need of replacement.) Most sites have parking for more than one vehicle. The roads are nicely paved and great for bicycling as are the bike trails. Our site was one of the sites with sewer as well as water and electricity. Very nice, especially when you're staying for two weeks. We camped at South Marcum Campground in a Motorhome. Rend Lake is a very large lake, though rather shallow in most areas. Plenty of opportunities for fishing and swimming. Nearby Benton is an interesting town with a lot of history and a very nice city square. Many sites have separate parking for your tow. Some are close to areas where boats can be parked. Some FHU and some electric only. We camped at South Marcum Campground in a Travel Trailer. Not sure why people rate this park so high. Differences of opinion I guess. It is a basic campground with back-in sites on the blind side. Yes, it has nice big sites and is quiet. If that is all it takes to rate a campground high, well there you go. Most sites are sloped to the rear. Water pressure was very good. The grass at my site needed cutting. No wifi, weak antenna tv signals. Knowledgeable check-in staff. Lots of deer in the park. Had a skunk come thru my site one evening. Glad I saw him before he saw me. Narrow loop roads and some trees on those loop roads need trimming. Directions on the park's site take you across the dam. Instead of that, it is easier to turn right at the Walmart (N Central St) once you get off the highway, then 1/4 mile past Walmart (keep Walmart on your right) turn left at the first stop sign (Rend Lake Rd). Follow that road about 5 miles to the park entrance. There is one 90 degree turn (Rend Lake Rd becomes Mine 24 Rd) about 1/4 mile after you make the first left. Other than that turn, there are 2 stop signs and VERY little traffic. The camp entrance will be on your right. We camped at South Marcum Campground in a Fifth Wheel. Check in was done by a very informative and friendly campground host. Our site was clean upon arrival. The one lane roads are a bit tricky if you are in a large rig. While our site was level, we saw many sites that were no where near level. Our site had water and sewer, but check before you reserve a site, because most of them were electric only. Very scenic area along Rend Lake. Showers were clean, but men's room for reason had no hot water, but my wife indicated the women's rest room showers were almost too hot if you turned the water up too high. Fire rings and picnic tables are at each site. Wal Mart in Benton is about 5 minutes away, so if you forget something, you won't have a long trip to town. A lot of space between sites. Overall, my wife and I enjoyed our experience at South Marcum and will return. We camped at South Marcum Campground in a Motorhome. The bike path in South Marcum is awesome! Check it out! Would have given this park a 10 if it weren't for the unlevel sites. However, that's the only negative. Very clean and spacious sites. The bike trail around Rend Lake is awesome. The whole area around the lake was very well kept. Even the ranger at the visitor center was very friendly. We will return here again. We camped at South Marcum Campground in a Motorhome. Bring your bike and enjoy the trail that goes through or by all the parks around the lake. Are you affiliated with South Marcum Campground ?